Hunter Pistol is a Firearm in Bloodborne; it's one of three pistol firearms in the game. "Pistol made at the workshop, for hunters stalking beasts. Hunter firearms are specially crafted to employ Quicksilver Bullets fused with the wielder's own blood, boosting damage against beasts. The pistol is a quicker draw than the blunderbuss, allowing for speedier responses to attacks." This firearm is the first pistol you can find/buy in the game. It has moderate scaling with bloodtinge and is a good choice for low bloodtinge builds. If your character has less than 21 Bloodtinge, the Hunter Pistol is stronger (in terms of pure damage) than the Evelyn. At 21 points, they are equal in power. Finally, if your Bloodtinge is 22 or higher, the Evelyn becomes the superior damage dealer. However, at equal Bloodtinge, the Hunter Pistol deals less damage per shot than the Repeating Pistol yet consumes only one Quicksilver Bullet per shot compared to the Repeating Pistol's two. This is a starting weapon gifted to you by the messengers if you choose. Otherwise you can buy it from the Messengers for 1600 Blood Echoes after you find the Saw Hunter Badge in the sewers; it is next to the Giant Boar. Being one of two firearm choices at the beginning of the game, the player must make a choice essentially between a handgun and shotgun. The Hunter Pistol does more damage, but the Hunter Blunderbuss is more effective at hitting a fast moving target (as well as potentially hit multiple targets at the same time). The other main difference between the two starting firearms is that the Hunter Blunderbuss has a slower recovery time between shots. Unlike the Hunter Blunderbuss, this firearm is very difficult to hit moving targets with, so it is important to learn when to fire in order to hit weak spots effectively, e.g. the head of the Cleric Beast to enable a visceral attack. The Hunter Pistol can be useful for ranged staggering, opening up visceral attacks, or dispatching small enemies. Can be used to lure opponents, but it may simply be better to use a Pebble for this purpose instead. At the perfect camera angle, you can see the Quicksilver Bullet in the gun's barrel. 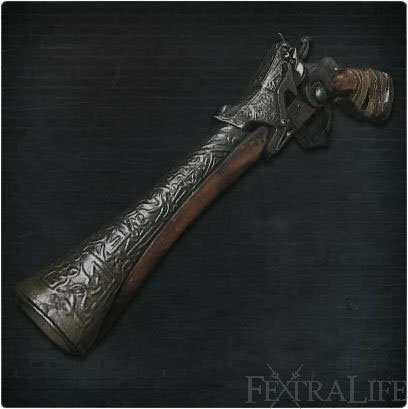 The Hunter Pistol is employed by Eileen The Crow, Henryk, Charred Hunter, Yahar'Gul Hunters and Father Gascoigne. Father Gascoigne carries a unique Hunter Pistol which fires Blunderbuss shells instead. According to the concept art, and Gascoigne's shotgun variant, the Hunter Pistol is a "break action" firearm. Got this at the first time, finished the game 2 times and the dlc s, never upgraded, removed from my left hand, repaired, or put a blood gem on it. still the best firearm. So I have defeated Rom but this pistol I havent changed nor really used so far. I have been rocking with 99 bullets for a long time now. Damage is very low I dont even think how blunderbuss performs damage wise. Only thing I can think of is staggering. Is that the only reason why there are pistols? Did some cleaning up on the page. One thing I was wondering though....do we want all weapon/firearms pages to state how many blood shards/twinshards/etc. to be posted on each page? IMHO it seems kinda weird since basically every weapon/firearm that can be fortified requires the same exact amount of materials.